This saves on gas and parking costs while improving your cardiovascular health and reducing your risk of obesity. In the US, 40% of all trips are 2 miles or less and 90% of those trips are taken by car. If one out of 10 people switched to an alternative method, CO2 emissions would be cut by 25.4 million tons/year. People who live within two miles of their work spend about $384/year to drive back and forth. If only 20 people in each U.S. state walked 2 miles or less to work, we'd save more than 64,000lbs of harmful pollutants being released into the air. Furthermore, if the average commuter carpooled every day, he or she would save 550lbs of poisonous exhaust emissions and 500 gallons of gasoline each year. According to the U.S. Department of Transportation, changing to carpooling can save a person over $1,000 per year and if you avoid driving alone only one day every week for a year, you can save hundreds of dollars in expenses, not to mention the wear and tear on your car. In colder months, adjust it to 50 degrees Fahrenheit and in warmer months, adjust it to 85 degrees Fahrenheit. This can save you up to $100 per year in energy costs for when you’re not home. Green Earth Technologies presents to you a certified bio-based motor oil, which is biodegradable, provides superior performance and protection and is naturally better than synthetic motor oil. Discover where to head next time you need your oil change. Green Earth Technologies also offers other eco-friendly products for your household, automotive, marine and the outdoors. There are hundreds of these throughout the U.S. who are committed to reducing chemicals, preserving landscapes, protecting wildlife habitats and decreasing water consumption. These courses save an average of 1.9 million gallons of water a year. Support their efforts by using them. Learn more. These boards are not only lighter, but last up to 5 times longer than boards made from polyester and fiberglass, float better, are stronger and harder to damage and the epoxy resins are typically less damaging to the surfer and environment than traditional resins manufactured from polyester. This helps reduce waste and preserve landfill space, however a drawback would be the board absorbs more water than polyester boards, which can offset it's lighter weight to a weight comparable to that of traditional boards. Learn more. Standby power continues to leach from your electronics and appliances even when not in use or “turned off.” If you don’t have a smart power strip, you should unplug them all, especially for vacations or long trips. Learn more. This will not only save resources in the manufacturing of new equipment and preserve landfill space, but you’ll be contributing to a good cause and you can receive a tax write-off as well. Visit Sports Gift and donate today to provide sports to impoverished and disadvantaged children throughout the world. Get outside, hike through a forest, park or mountain, take a swim in a lake, river or ocean, go camping, picnicking, visit nature centers and observe wildlife. Spending time outdoors can lower your blood pressure, fight off depression, beat back stress and even prevent cancer. Children who spend more time outdoors are less likely to develop myopia (near-sightedness) than children who spend more time indoors. Spending time outdoors can keep you healthier, fit, embraced to the natural world, can improve our cognitive abilities, help prevent developing allergies and asthma and even improve your eyesight! You can even help clean up the environment while exercising outdoors. Learn more. This will save on the energy otherwise needed to make multiple trips. Also, always try to buy items you know you will always need in bulk! The faster you drive and accelerate, the more fuel is burned and the more money you will have to spend refueling. Rapid acceleration and rapid braking can lower gas mileage by 33 percent at highway speeds and 5 percent while driving in the city. Discover many more ways to save on gas! This could improve your gas mileage by about 3% and makes your tires last longer. Just by maintaining tires at the right pressure, the average American, who drives about 12,000 miles per year at 25mpg, could save about 16 gallons of gasoline per year. Learn more. These easy and relatively inexpensive maintenance options that will save you gas and extend the lifespan of your car. The air filter keeps the inside of the engine clean and the oil filter sifts contaminants out of the oil to keep it cleanly flowing through the engine. The cleaner the oil, the fewer the contaminants. Change your oil and oil filter every 3,000 miles or 3 months, check your air filter with every oil change and be sure to recycle your used oil filters. Learn more. These mats are made from plant-based materials, such as cotton and natural rubber, as opposed to typical petroleum-derived plastics or other synthetic type mats, including mats made with PVC, the most toxic plastic in the world. Learn more. Carrying around extra stuff in your car means your car has to work harder and use more gas, especially if your extra stuff is heavy. An extra 100 pounds in the trunk cuts a typical vehicle‘s fuel economy by up to 2%. You can save up to 9 gallons of gasoline per year, which is almost $40, by removing an extra 100 pounds of unneeded items from the trunk. RENTACRATE efficiently uses reusable crates to help the environment. Instead of referring to the traditional and inefficient method of cardboard boxes for storing and transporting movable items, call RENTACRATE to move to your new home or for any means that requires extensive storage and relocation. Don't like RENTACRATE? Use Green Van Lines instead! Steel frames conserve energy and can be made from recycled materials whereas aluminum frames must be manufactured from new, virgin ore which requires more energy to make and cannot be derived from recycled materials. Learn more. People spend an average of nearly five full workdays - 40 hours - per year in traffic delays. Taking public transportation is cost effective, reduces air pollution, can save you time and allows you to relax, read or nap during your commute instead of fighting, stressing and feeling the road rage. Learn more about the benefits of public transportation! This can save you up to $30 per ticket and the airliner tens of millions annually by eliminating paper tickets altogether! and go the extra step and pick up and properly disposes of any trash you may see! Research shows about 85% of littering is the result of individual attitudes. Changing individual behavior is key to preventing litter. Learn more. over ones made from PVC or petroleum-derived virgin polyester, which are less recyclable and potentially toxic. Learn more. This will save you money, time and paper waste in comparison to picking up guidebooks on the go. Online maps are free online and can be recycled after using it. Typical map paper is very difficult to recycle due to all the ink used. These hotels have facilities and programs that conserve energy and water and offer competitive prices to regular hotels. Many hotels and hotel chains have adopted practices such as the use of nontoxic cleaners, offering natural and organic foods and snacks, printing their materials with soy ink on recycled paper, LEED certification, even green toothpaste and making recycling bins available in every room to satisfy a growing consumer desire to make more ethical purchasing decisions. Search for Green Hotels! These are sold in reusable mesh bags or paper boxes instead of plastic or metal tubes with aluminum and also last longer. Due to internal pressure slowly seeping through the walls of a standard tennis ball, over time, they lose their bounce, become soft and go dead. With pressureless tennis balls there is no loss of pressure, so they maintain their bounce longer making them economical to practice with. Using pressureless balls will save you money in the long run. Learn more. Americans use enough paper cups in one year to circle the globe 55 times. Try to avoid paper and styrofoam cups with reusable mugs, cups or bottles. These cups largely come from trees and styrofoam cups remain on the planet for nine generations. Learn more. By traveling out of season, you can save yourself as much as 40% on travel costs, avoid crowds, reduce and avoid congestion and traffic and get to enjoy your destination better! Cruise ships consume thousands of gallons of fuel per hour, disturb fish habitats, can spill sewage and oil, disrupt ports and seas and produce more CO2 emissions per person than any other form of transportation. Try something different – try an eco-friendly sailing cruise, which have fewer carbon emissions and minimal habitat disruption in ports where you dock, which means smoother sailing for you and the planet. Discover eco-friendly cruises and greener sailing! A hybrid car rental can go 3 times as far as a standard sedan on a single tank of gas! In the last 5 years, 98 million people went biking, hiking, kayaking and white-water rafting in the great outdoors. Taking on this unique trip and vacation brings adventure and replenishment into your life, physically, emotionally and spiritually. However, when hiking, climbing or biking, try to stay on the trails to avoid damaging the surrounding environment. to calculate the money-saving potential of your car! Carry And Refill A Reusable Water Bottle Or Canteen With You On Your Travels! Ride That Bicycle and Enjoy the Benefits! Bicycle riding has many wonderful benefits for the body, mind, pocket, environment and spirit. Let's take a look at why bicycle riding is so incredibly enriching to one's overall physical and mental health, resourcefulness and environmental stewardship. You can ride a bicycle almost anywhere, at any time of the year, and without spending a fortune. Many people are put off doing certain sports because of the high level of skill that seems to be required, or perhaps because they can’t commit to a team sport due to time pressures. Most of us know how to cycle and once you have learned you don’t forget. All you need is a bike, a half an hour here or there when it suits, and a bit of confidence. Learn more. National Diabetes Information Clearinghouse states that bicycle riding just a few times a week reduces and helps combat these health conditions. Live Strong offers more information on this wonderful benefit. If you bike to work, you won't have to go to the gym to get your exercise. You'll save yourself time by killing two birds with one stone. Plus, using that extra time to relax can boost your immune system. Learn more. According to the Mayo Clinic, 30 minutes of exercise 3-5 times a week significantly reduces anxiety and depression. Many people experience joint pain, especially in the knees, as they get older. Bicycle riding offers exercise without pain. The aerobic benefit is comparable to running or jogging, but without the strain.Make sure the seat height on your bike is adjusted to allow your legs full range of motion with each push. Full range of motion also promotes better circulation to the lower extremities, which do the majority of the work in moving the bicycle. Learn more. Contrary to normal perceptions, cycling is not a fitness activity that solely involves the legs. Cycling builds strength in a holistic manner since every single part of the body is involved in cycling. Learn more. Cars are a major source of the pollution that is contributing to the environmental and health problems we have today. Most people in the United States use their cars to make even short trips of a mile or less. Cycling to work, the store and anywhere else within the vicinity helps reduce pollution, fossil fuel consumption and CO2 emissions. Cycling is an activity that involves the whole body improving arm-to-leg, feet-to-hands and body-to-eye coordination. Also, balance and flexibility are improved. Learn more. Any regular exercise can reduce stress and depression and improve well being and self esteem. Cycling outdoors is no exception and is also a good way to connect with your natural surroundings. It takes one’s mind out of everyday-life stress and rejuvenates the spirit. Learn more. Bike riding is all about maintaining balance. Maintaining this coordinated balance strengthens the core muscles of the abdominal region. The lower back is also kept pain free by a strong, balanced core. Learn more. According to the British Medical Association, cycling just 20 miles a week can reduce the risk of coronary heart disease by 50%. A major study of 10,000 civil servants suggested that those who cycled 20 miles over the period of a week were half as likely to suffer heart disease as their non-cycling colleagues. Learn more. Cycling is a good, effective way to build stamina because people enjoy cycling so much that they wouldn’t really notice that they have gone farther the last time they went cycling. Learn more. ...nearly three times as happy as solo car-drivers! Cycling gradually improves general muscle function with little risk of over exercise or strain. Regular cycling strengthens leg muscles and is great for the mobility of hip and knee joints. You will gradually begin to see an improvement in the muscle tone of your legs, thighs, rear end and hips. Learn more. Cycling makes the heart pound in a steady manner and helps improve cardiovascular fitness. Studies have shown that cycling to work will increase cardiovascular fitness by 3-7%. Cycling uses the largest muscle groups the legs, raising heart rate to benefit stamina and fitness. Learn more. Bicycles obviously don't require gas to run on and lessen other costs associated with driving, such as maintenance and insurance costs. Cyclists absorb fewer air pollutants than drivers. 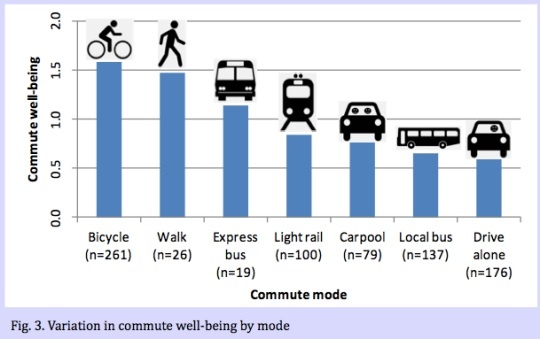 Even if the air in your city isn't the best, biking is still better than driving. Learn more. Cycling is a good way to lose those unwanted pounds. Steady cycling burns approximately 300 calories per hour. If you cycle for 30 minutes every day you would burn 11 pounds of fat in a year. Since it helps build muscle, cycling will also boost your metabolic rate long after you’ve finished your ride. Learn more.